Intrigued by the prospect of an exhibition of neo-conceptual embroidery, I crossed the Ottawa River to see Rosika Desnoyers’ Partridges at Art-Image in La Maison de la culture de Gatineau. The title of the exhibition is taken from a late 18th Century embroidery by the British artist Mary Linwood, which is the main point of reference for the entire show. Two needlepoint copies of it by Desnoyers, one that is relatively faithful and one that is a black monochrome, are featured. Apart from another needlepoint work at the entrance, the remainder of the exhibition is comprised of black and white reproductions of pages from Pictorial Embroidery in England, Desnoyers’ critical history of needlepainting and Berlin work just published this month by Bloomsbury Visual Arts and available for consultation at the gallery. The exhibition can be understood more generally as a kind of expanded book launch. With discrete and concrete elements of the publication on display, Partridges offers an immersive experience of the text as well as a primer on the artist’s practice as it is linked to her research and scholarship. The first piece you encounter in the exhibition is After Jan Vermeer, The Lacemaker, which is also the cover image for Desnoyers’ book. 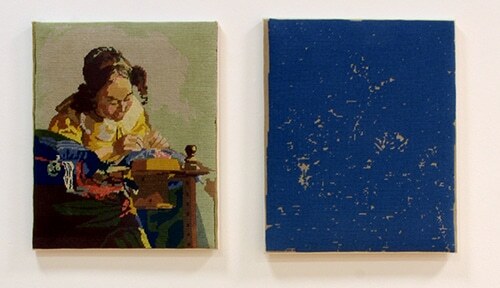 The work is comprised of a needlepoint copy of Vermeer’s painting that Desnoyers purchased and her own monochromatic needlepoint copy of the copy. The latter interprets and preserves the imperfections of the first with a missed stitch, thereby leaving sections of the canvas blank. The result is an abstract blue colour field with bare patches the render a systematic and impersonal homage to the hand of the maker. It is an economically compact work that compresses a complex history of the labour of image-making into one gesture. The content of the image (a young woman making lace) and its form (needlepoint) situates the work not only within a gendered practice but also a discredited one that has been denigrated to the status of craft hobby. Desnoyers’ work uncovers this history and connects it to the present. The relative lack of materials in Desnoyers’ installation and its emphasis on scholarship places it squarely in the tradition of conceptual art. Thirteen pages from the book are reproduced at a standard but maximum size (a little less than three by four feet) on the same weight of paper commonly used in home offices. Introductory pages including the title, table of contents, and preface are supplemented with all of the pages from the book that feature images of work by Mary Linwood. Excerpts of the text also give a brief description of Linwood’s character and her ambiguous status as an artist, which in this context invite a comparison with Desnoyers. Additionally, the enlarged reproduction of Linwood’s Partridges in Fig. 1.12 of the book ends up being approximately the same size as the original, and in the exhibition it appears side by side with Desnoyers’ own needlepoint rendering of it. The two copies variously conjure up the absent original, which was itself a needlepoint imitation of a painting by Moses Haughten the elder. Rosika Desnoyers: Partridges continues until March 10. Michael Davidge is an artist, writer, and independent curator who lives in Ottawa, Ontario. His writing on art and culture has appeared in Border Crossings, BlackFlash, and C Magazine, among other publications. He is Akimblog’s Ottawa correspondent and can be followed on Twitter @MichaelDavidge.